Santorini Island in Greece, is the most southern of the Cycladic Islands. Many refer to it as one island, but it is a complex of five islands. Santorini (Thira) is the main island and around it is Thirasia and Aspronisi (parts of ancient Stroggili) and two volcanic islands Palea Kameni and Nea Kameni that have formed in the center of the interior bay. It was one island named Stroggili (meaning circle in Ancient Greek) until about 1645 BC, when the volcano that formed the round island, peaking in the middle, literally blew it’s top, with the peak disappearing into the ocean, forming the present-day crescent shape island ringed on the interior of the crescent by the Caldera. The two volcanic islands appeared much later from various eruptions starting from 157 BC until the last one in the 20th century in 1950. Many reasons have made this island famous worldwide including its oft photographed white buildings with blue domes and trim overlooking the Aegean blue sea. 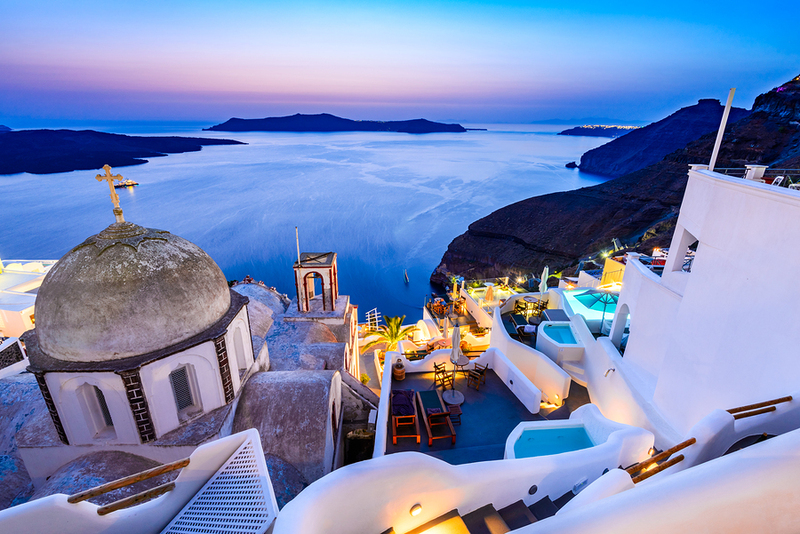 Some even have claimed Santorini is the mythical “Lost Atlantis”. 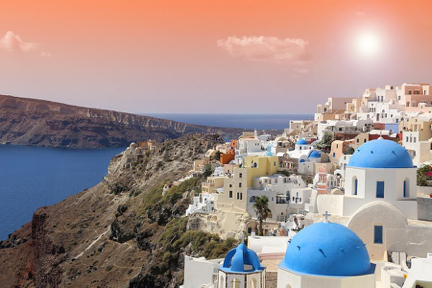 Jules Verne made Santorini famous with his books “Twenty Thousand Leagues Under the Sea” and “The Mysterious Island” where Captain Nemo and his crew watch one of the volcanic eruptions. Jules Verne was one of the scientists that came to Thira during the eruptions of 1866 – 1870 and after his visit, wrote the well-known books. It is an island where the Volcano rules and the Caldera view is breathtaking! Santorini has a unique architecture of “cave” buildings, built into the side of the Caldera by excavating enough dirt and rock to create literally a cave, with a built front including a door and windows for light. Inevitably the interior space is crescent shaped as the arch is one the strongest architectural shapes used in building. Usually the front porch of one building is located on the roof top of another, creating staggered stepped structures that spill down the front of the Caldera, reached by a multitude of steps. Wine Tasting: Boutari is one of the great wine houses of Greece and their winery in Megalochori is the largest on the island. The company gives tours of the installations and wine cellars and has a fancy multimedia show in a remodeled vault. Enjoy a wine tasting in the Tasting Room. Akrotiri Excavations: Akrotiri Excavations are the ruins of probably a Minoan city buried by the 1500 B.C. volcanic explosion. A truly amazing archeological site, still very much under excavation, with the current belief that only 5% of the site has been excavated. This is an entire village that was discovered in the mid-19th century. It had been covered in volcanic ash, much like Italy’s Pompeii, and appears to be undisturbed after being buried for centuries. This is not a well-marked site, so hiring a guide, available at the site, is recommended. 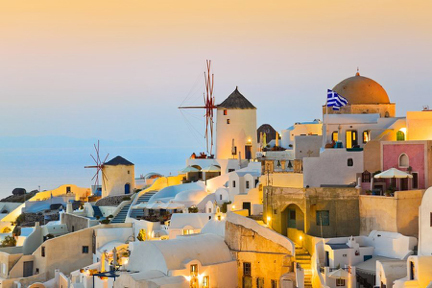 Fira: The capital of Santorini, Fira, straddles the edge of the Caldera. Stroll its winding, narrow walking streets while visiting ancient marketplaces and churches. There is a superb view from Fira to the Kameni’s, the two islets of black stones created by the volcano. Visit the Archeological Museum of Fira where artifacts, including wall murals, excavated from Arkotiri are exhibited. This is an excellent shopping village, where chic shops of couture rub shoulders with shops of traditional goods, especially bottled capers. Oia: The most charming and well preserved of all the Santorini villages, Oia is 12 km from Fira, and famous for spectacular sunsets seen from the village streets. 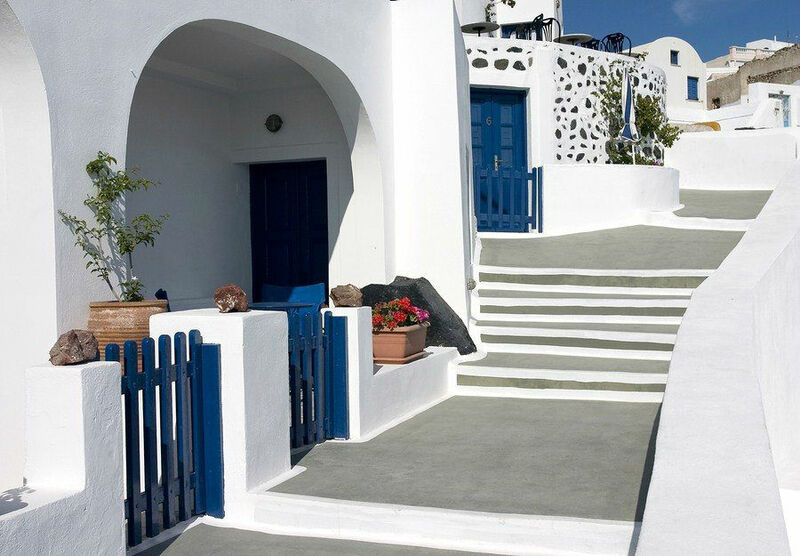 Oia is home to artists and writers from around the world who are attracted to its stunning beauty and light. Explore the shops and art galleries for unique and interesting finds. Nightlife: Santorini has an active and very chic nightlife, especially in the capital Fira, where dancing takes place on patios overlooking the Caldera. As always, the patio being danced on, well could be the roof of the building below. 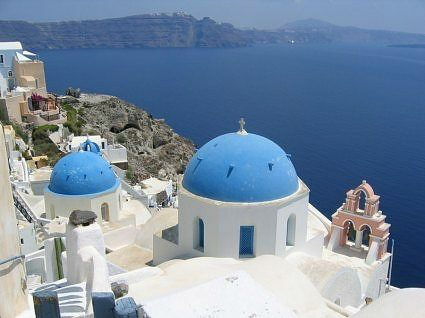 Santorini is more an island for wealthy Greeks visitors, rather than the international jet set. Nightclubs provide entertainment until dawn. However, the best activity on Santorini is to take in the ever-changing views from the top of the Caldera as the sun moves from one side of the Caldera to the other throughout the day, which can provide an ever changing and unique panorama unlike anything seen anywhere else in the world.